Being in debt is one of the most common financial struggles moms deal with. When we are in debt, we are often focused on getting out of debt. Now, I know that you´re probably thinking that having debt is really bad, but since you made the purchases due to your own choices, it is easier to deal with it. But what if I tell you that your debt is not always accrued by you but also by your partner? What if I tell you that you could have ruined credit score without even noticing? Domestic financial abuse can take many forms and causing the victim debt is only one of the ways the abusers use to exert control. 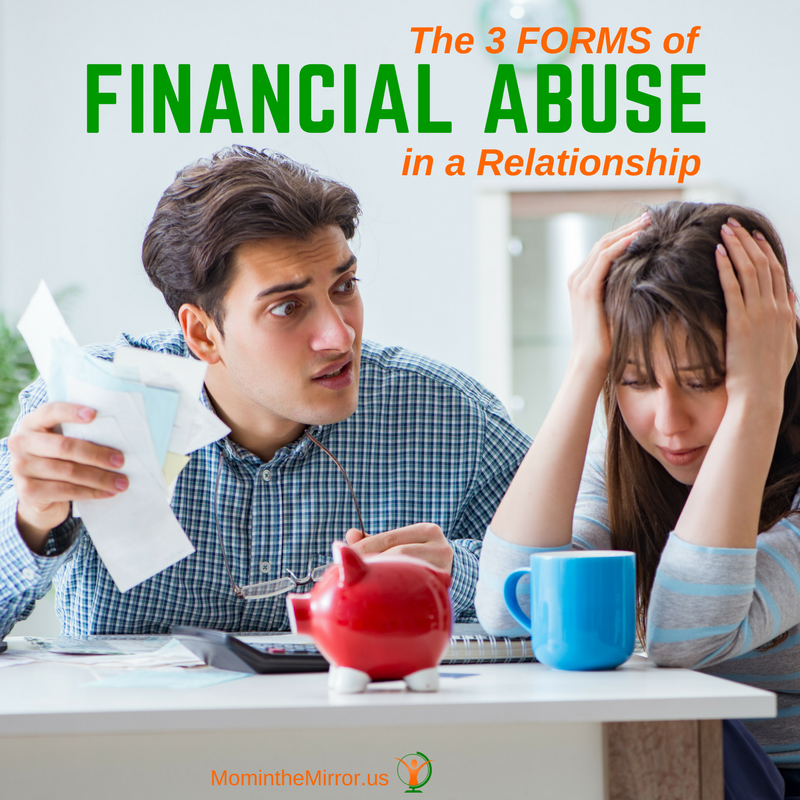 It is so easy to fall in one of the domestic financial abuse traps when you are not in charge of your finances because as moms we tend to delegate this responsibility to our partner, allowing him to make many decisions that may probably harm our financial life. When you don’t know about domestic financial abuse, you´re more vulnerable, but knowing the different forms in which domestic financial abuse can be experienced will help you and other moms like you identify the patterns in your own relationship in order to be aware and prevent domestic financial abuse and/or to help you in your way out of this awful situation. Domestic financial abuse can be manifested in three forms: employment sabotage, economic or financial control, and economic or financial exploitation. Employment offers a viable form of generating income and, therefore, financial self-sufficiency for moms. That could be the main reason why abusers will deliberately destroy, damage, or obstruct victim´s employment performance. This form of domestic financial abuse may be manifested in different ways, because depending on the specific circumstances of the relationship, abusers will apply different strategies in order to sabotage your employment. My friend lost her job due to her husband stalking her on the job site. Even when he had a job himself, he would visit her at her workplace without any notice. He would arrive at the company and he would stand anywhere trying to listen and see what my friend was doing, just to have an excuse to mistreat her, embarrass her in front of her coworkers, and then again when back in the house. On several occasions he also had verbal discussions with my friend’s coworkers, if he considered that the tone in which any of them addressed his wife seemed too friendly. All this, along with repetitive calls during the working hours, late arrival and absences from work–due to her partner–caused my friend to lose her job. According to a qualitative study by Rothman et al. in 2007, just like my friend, other victims of domestic financial abuse lose a stunning total of 8 million days of paid work each year. Other forms employment sabotage are manifested include but are not limited to manipulating you to work in a family business for little or no pay; interfering with your performance at the workplace, demanding you to quit your job, keeping you from going to work and leaving early, and pressuring you for having many children. If you are unemployed, he may sabotage you by forbidding you to work and preventing you from getting interviewed, or from answer emails or phone calls that are part of a hiring process. He could also forbid you to earn any money or attend school or training sessions since a higher education level will impact you positively, possibility to get an income by yourself or have a better job. One of the most powerful forms of control in an abusive relationship is controlling money and any financial resource. Without money it will be harder to make a decision about what to do, what to eat or buy, where to go and even when to leave, since all of them will require money that you don´t have. You may feel like you have no control of your life and that your partner is the only one who controls your household money and therefore your life, but it is not true. Domestic financial abusers will use economic control to keep your hands off the money so they can keep you in their hands. Controlling how money is spent is one of the main strategies used with this dark intention. In order to achieve this, the abuser will make you ask for money, and to be accountable for every penny you spend, like giving you a list of what you should only spend money on and demanding you to give him receipts and/or change after spending money so you don´t even have pocket money. Other strategies for financial control are: withholding money or basic living resources (such as food, medications, clothes, shelter among others); giving insufficient allowance, preventing or forbidding you from obtaining any banking products (such as credit or debit cards); refusing to include you in important meetings with banks, financial planners or retirement specialists; manipulating you to turn over your benefit or public assistance payments, keeping financial information from you, and taking household decisions by himself without your participation or consent. When domestic financial abusers use your financial resources for selfish purposes it is known as financial exploitation. This form of financial abuse in one of the most damaging ones which effects may lead to long-lasting negative scars on your current and future financial life. Abusers will exert domestic financial exploitation to take advantage of your assets and even destroy them with strategies such as refusing to work to help support the family, while controlling your money; manipulating you to cash in, sell or sign over any financial assets or inheritance you own, such as bonds, stock or property; convincing you to agree to a power of attorney in order he could later take any financial or investment decisions that affect you without your consent. Another strategy I recently heard of in a conference I attended over the weekend, is manipulating the victim for you to give access to your money or financial accounts. Domestic financial exploitation is also used to ruin your credit by overusing your credit cards, taking loans on your behalf without your consent and refusing to pay the bills or paying them late, and spending the money needed for rent or bills in personal matters, excessive gambling, among others. Ruining your financial credibility is also another malicious goal included in financial exploitation. The abuser will manipulate you to file false tax claims or other legal/ financial documents and he will later report you for “cheating” on your benefits so they will be cut off. When you´re facing these financial struggles it may not seem so obvious that they´re intentionally caused by your partner, but as you could read in my findings about the different forms of financial abuse in a relationship, you can see that all the three forms have the intent of keeping you without any money or financial resource so you remain solely dependent on the abuser. The way abusers implement their strategies may be subtle or overt, however, they may provoke invisible scars that will impact your life for years, making it more difficult for you to leave the relationship and survive without money until you can recover your financial self-sufficiency. Now that you know the different forms domestic financial abuse can take, what strategies do you think you could implement right now to stay safe form this harmful form of abuse?